Are you hearing strange sounds? Is the motor completely silent no matter which control you use? It might be time for some opener repairs. The good news is we've got you covered! Our company services all chain, screw and belt drive openers of all brands without exception. We can replace a broken trolley or moving gear on the spot. If the safety sensors have failed, rely on us to install new ones. If you lose your remote, we can replace it for you within the same day. Let us give you the convenience, safety and security that you require. 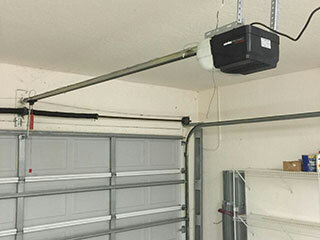 In general, garage door openers are powered by electricity. They are the rather small devices, usually installed against an angle iron on the ceiling. They have a motor which is connected to the trolley with a chain, screw or belt drive guide according to their model. The trolley is connected to the door which moves up and down. All openers nowadays come with safety features which include the photo eyes and reverse mechanism as well as the emergency release cord. In addition, some models come with a backup battery. Garage door opener systems are smart these days. Our professionals at Garage Door Repair Minneapolis outsmart them. By knowing every little thing about the latest models produced by Chamberlain or Marantec, we are in position to help our customers get what they want and to provide excellent services. We have Genie repair specialists and guarantee perfect services. With our knowledge of the latest operating systems of all big manufacturers, our training and dedication, all services related to door openers are distinguished for their prominence. Since the importance of openers is huge, our response is fast and our company also offers emergency garage door repairs. Whether you have problems with your Liftmaster door opener or suspect an issue with the sensors of any other brand, trust our company. Our company also specializes in openers made by Sears and Craftsman as well. We have a dynamic crew in order to check the reasons for the door not closing all the way and promise excellent work. You can also count on us for regular opener maintenance. Our technicians are extremely thorough and since our routine service includes the meticulous inspection of all opener parts and their repairs, we guarantee perfect performance and safety. Problems With Your Opener? Call Garage Door Repair Minneapolis Today! Our team is always happy to assist. Contact us online for any related question, or give us a call for same day services.